hey guys how can i make this sword look more like a sword? I suggest you show the whole blade. The handle looks very pretty but I couldn't it was a sword if you didn't say. First of all what exactly do you want to looks more like a sword , the blade or the rose like things? the rose like thing? the whole of it actually i wanted it to pass the feel of a rapier but seems i failed. or you could sacrifice showing the detail of the rose and make it smaller to fit how adamant are you over keep the composition as it is? If you're willing to change it, one way is to position one of the boy higher than the other (aka not the same level;) and adjust the size of the sword just so it fits snugly, Another way is to position the sword at a slant and again the boys are at different level. You can play around with the composition and see which you like best. how adamant are you over keep the composition as it is? If you're willing to change it, one way is to position one of the boy higher than the other (aka not the same level;) and adjust the size of the sword just so it fits snugly, Another way is to position the sword at a slant and again the boys are at different level. You can play around with the composition and see which you like best. humn i chose to sacrifice a bit the sword to who wore of the blade, you think it gives more the feeling of it being a rapier like this? Using textures would work. I do think the rose part is a bit too much for the blade and the actual handle. What I would do is extend the bottom of the poster, keep it black with nothing more added except showing the full length of the blade. Is it size restricted? Val-chans sugestion isnt bad, google some Textures in images and try different out like a Paper Texture you put above your image and change Colormode. Which Software don you use? Val-chans sugestion isnt bad, google some Textures in images and try different out like a Paper Texture you put above your image and change Colormode. Which Software don you use? optimal size for the posters is 700x500 but i can use a vertical composition i have not thought about it and i just changed the size of the canvas and i loved D: leaving the text in the middle and the full sword will really look better let me continue with what i was doing! leaving the text in the middle and the full sword will really look better let me continue with what i was doing! 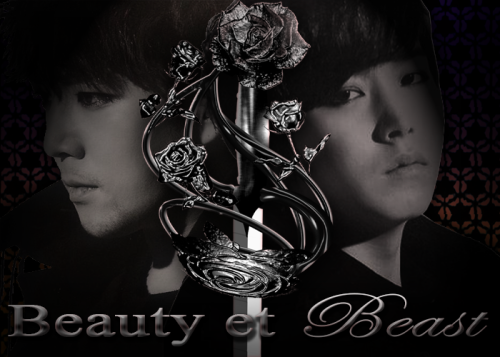 okay my brain fried i need sleep XD but well now i am actually in love with this out come https://lh6.googleusercontent.com/-0PSA1_2BYQo/VQTBeH-1qlI/AAAAAAAAKYs/OkIoUDOcd4U/s800/beauty-et-beast4.png should i dim the flare a but or is it good? should i add a story quote or something at the bottom or leave it like that all black? should i dim the flare a but or is it good? should i add a story quote or something at the bottom or leave it like that all black? I really don't get why everyone keep saying to add texture. Rapier are suppose to be beautiful smooth blade. Are they texture for the background that you guys are talking about? What kind of other details does a rapier need? Other than on the handle its a fairly simple sword. If you want to add shadow, add it under the text to give a sense of distance and make it look like the letters are popping. I would make the letters smaller and position it higher up so that the combination of sword and wording would look like a cross (you can also make it a reverse cross if the negative space at the bottom bothers you so much). It would make the layout looks cleaner if you didn't make it so that the full length of the letters is almost touching the edges. Cut the length to about 2/3 of the poster width. Now I know that this poster isn't for print but it's always a good idea to give about I cm margin of the edges (measurement depends on the overall size of canvas ofc). I know that people do not like to waste space but they should learn that negative spaces if properly utilise can bring out so much more to the design than an over crowded one. People, please learn how to KISS (keep it simple stupid)! I really don't get why everyone keep saying to add texture. Rapier are suppose to be beautiful smooth blade. Are they texture for the background that you guys are talking about? What kind of other details does a rapier need? Other than on the handle its a fairly simple sword. If you want to add shadow, add it under the text to give a sense of distance and make it look like the letters are popping. I would make the letters smaller and position it higher up so that the combination of sword and wording would look like a cross (you can also make it a reverse cross if the negative space at the bottom bothers you so much). It would make the layout looks cleaner if you didn't make it so that the full length of the letters is almost touching the edges. Cut the length to about 2/3 of the poster width. Now I know that this poster isn't for print but it's always a good idea to give about I cm margin of the edges (measurement depends on the overall size of canvas ofc). I know that people do not like to waste space but they should learn that negative spaces if properly utilise can bring out so much more to the design than an over crowded one. People, please learn how to KISS (keep it simple stupid)! @dad maybe they mean filter over the whole thing? so with roses or without roses? 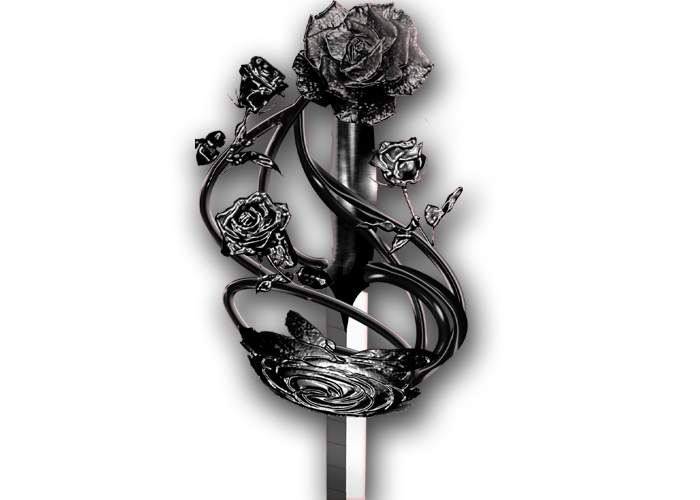 The roses are a nice add but whats about the Black Spacebehind the sword? Use a eraser with less Opacity (I use alway 20%) and hardness 0 And try to merge the Black Space with the Chars. If you dont want a Texture its fine but it could make the Whole Image stick out more. Try different colortones on the Blade like the Brighter one with some more brigther Reflections, Real swords never looks Onecolored you can see the different grey and silver colortones depending on the light reflection.